A teenager facing 18 counts of arson in Mayerthorpe, Alta. is a junior volunteer firefighter who helped to fight a number of the fires he’s now accused of setting. 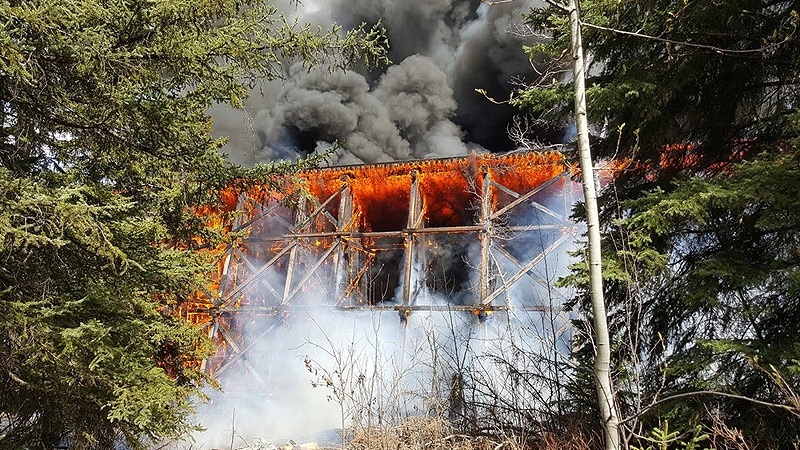 Lawson Michael Schalm, 19, was charged by Mayerthorpe RCMP in connection to a recent rash of blazes in the town of 1,400 people about 120 kilometres northwest of Edmonton, including a fire that destroyed a historic CN trestle bridge. Schalm’s father Albert Schalm, a former mayor of Mayerthorpe, told CTV Edmonton he learned of his son’s arrest through social media. He said he was in “total shock” and struggling to deal with the charges but that he supports his son with unconditional love. RCMP said tips from the public led investigators to eventually arrest the volunteer firefighter. Fire chief Randy Schroeder said his department is shocked by the arrest. He said Schalm started as a cadet with the department at 15 and became an eligible firefighter on his 18th birthday. Schalm was on five of the scenes in question as an active firefighter and at least another four as a bystander, said Schroeder. Schroeder said the situation is “heartbreaking” because firefighters earn the public trust by doing a difficult, dangerous job. He said fighting and investigating the rash of fires has taxed his department. Firefighters responded to five fires on Friday alone. “At the height of this [past] week we were running calls an hour to an hour and a half apart. With the trestle [bridge fire] we were 12 to 14 hours on that scene,” he said. The wooden bridge was destroyed last Tuesday in a spectacular blaze that led to the evacuation of two schools and a trailer park. It took about three dozen firefighters from four departments, helicopters and a water bomber to douse the flames. Mayor Kate Patrick said the community is grateful for an arrest but saddened it is someone well known. 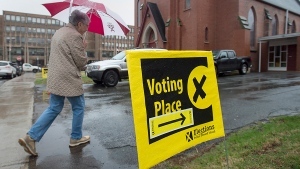 “It’s a sad day but it’s a relieving day for the community that someone has been apprehended,” Patrick told CTV News. Patrick described the family as a “well-respected and very nice family” and she urged the community to support them. Schalm’s Facebook page includes pictures of him in bunker gear and sitting in a fire truck. “He had a goal of what he was going to be doing after he graduated and he was working towards that and that’ll be on hold for a little while but we’ll get him back on the right road,” said the accused’s father. 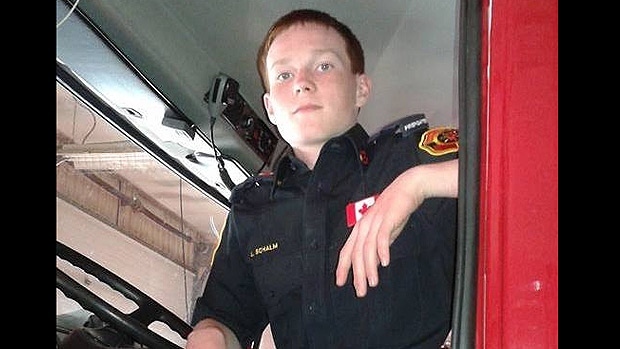 The teenager was a “great firefighter” and destined to be a longstanding member of the department, said the fire chief. He was only 18 months into training, so was not qualified for interior attacks but on exterior firefighting “he was used an awful lot,” said Schoeder. Any change in Schalm’s behaviour was just attributed to him growing up, said the chief, but he declined to offer specifics, saying it will all be under investigation now. Schalm will remain in custody until his first court appearance in Stony Plain Provincial Court on May 4. Flames engulf the trestle bridge northwest of Mayerthorpe in an image released by town officials. Supplied.